Having partnered with 14 of the best insurance companies in Singapore, we can quickly compare insurance quotes and find you the cheapest but most reliable insurance for your car. By letting us do “FREE” car insurance quotations for you, you can narrow down your choices, save time and pick the best car insurance coverage that is suitable for your needs. When you submit a request for car insurance quotation at Speed Credit, we will send you up to 5 of the best but at the same time cheapest car insurance quotation from our trusted insurance partner. So,if you’re looking for something that can beat your current insurance provider’s quote, or you’re looking to insure a new car, our car insurance quote service will be perfect for you. Contact us today at +65 6444 4400 for more information. Request for Car Insurance Quotations Today! Please fill our easy to fill up online car insurance request form here. We promise to get back to you within 1 working day. NEED A CAR LOAN IN SINGAPORE? 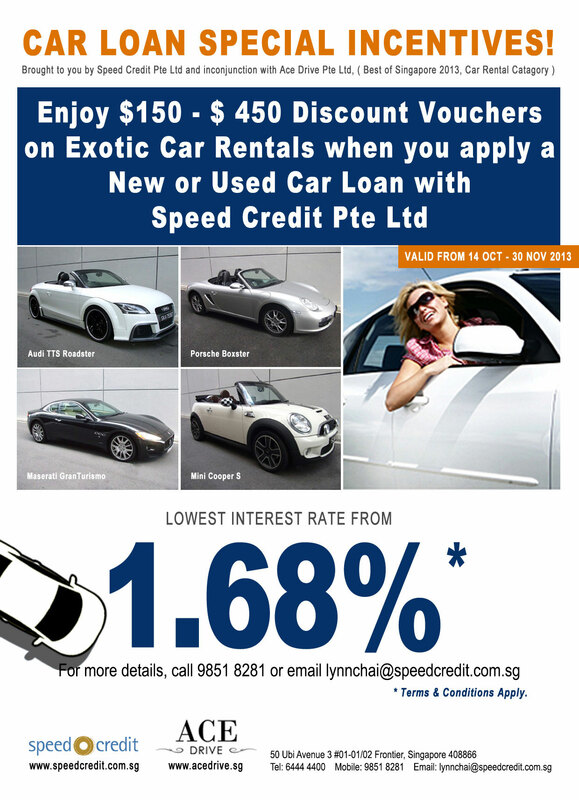 Speed Credit can help you with your car loan needs in Singapore. We will do car loan submission & processing, transfer of vehicle ownership & all other paper works for you. Having partnered with 13 of the best financial institutions in Singapore, we are confident that we can get you the best car loan deal! Click here to fill up our used car loan application form. Get your free car insurance quotations today! Fill up the form here to receive 5 of the most competitive car insurance quotes in Singapore. Speed Credit is partnered with 15 of the best car insurance companies in Singapore, so really, getting you the cheapest quotes will be a breeze! Add us on Facebook to get our latest updates, news & promotions! If you are a successful loan applicant & are a member of our Facebook Page, we will automatically reward you with car rental & new or used car cash vouchers worth up to $1,000! Speed Credit Pte Ltd (Business Registration #200000423N) specialises in new & used car loan in Singapore. Other car financing services offered includes refinancing car loan, COE renewal car loan, commercial vehicle loan and in-house car auto loan. Contact us today at +65 6444 4400 for a free financial advise. Aside from being a top-notch auto financing company, we have also grown as one of the leading used car dealers Singapore. See our used cars listings at sgCarMart, Oneshift, SVTA, ST701 Cars.